I have to be honest. When approaching this article, my initial reaction was something along the lines of, ‘Ha! Bing doesn’t do anything better than Google!’. But on brushing aside my Google superiority complex and after a bit more considered thought and research, I came to the realization that Bing does do some aspects of search better. Quite a few things actually. Let’s first take a look at the market share between the two rivals. In the US, Bing occupies a third of the market. A third! That’s pretty high given that ‘Google it’ is now a heavily used phrase by the masses, whereas have you ever heard anyone say ‘Bing it’? Probably not. In the UK, Bing isn’t far behind with a 26% share of the market. It is, however, worth noting that worldwide Bing only has 5% of the desktop search engine market share, whereas Google has 87%. That’s a big discrepancy. Bing is undeniably still a key player in the search engine rivalry contest and it has many enviable features. So back to the question in point. What does Bing do better than Google? 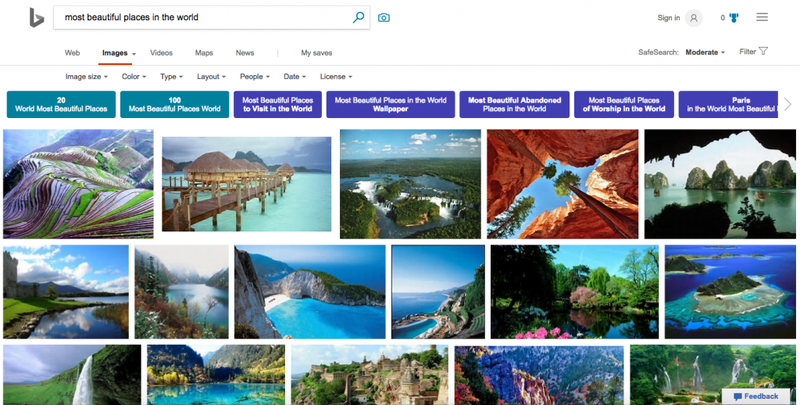 Probably one of the most well-known advantages of Bing is the image search, offering sharper and higher quality images in the results page. Bing was also the first to introduce the ‘infinite scroll’ to evade the need to painfully click through the various pages of image results. Google has since caught onto this ingenious function so Bing no longer has the advantage here. However, Bing does still maintain the advantage when it comes to filters. Unlike in Google, you can search for different image layouts – tall, wide or square. Aside from this functionality, Google generally has most of the same filter options that Bing has, although you have to dig a little deeper to find them. One noticeable example is the licensing information of images – most people probably don’t even know that Google offers this data because the filter is pretty hidden. On Bing it is wonderfully obvious; nobody likes digging, accessibility please. The only downside of Bing image search is that it does not yet offer GIF images in the results pages. You’ll have to resort to Google for those. A minor point though and one that I hardly think will be a deal breaker for most people, so Bing still wins on image search overall. I know what you’re thinking. Google owns YouTube, so how could Bing’s video search possibly be superior? It’s all in the display, and Bing have really nailed it with their video search results. Presented as a grid of thumbnails, users can watch videos without even leaving the SERPs. Hover your mouse over the thumbnail for a handy preview and view a higher number of videos without the need for scrolling. Let’s be honest, we are inherently lazy when it comes to internet usage, so we’ll take any time reductions on internet browsing. You heard, Bing gives you free stuff for using Bing. Akin to a loyalty card in your local cafe, Bing offers a similar reward scheme using a points system. Sure it’s not a technical reason to use Bing, but there’s nothing like a bit of bribery to win people over! Called Microsoft Rewards, it works by awarding you points every time you search. These points can be redeemed for a whole variety of outlets, from Starbucks to Amazon and everything in between. Okay, you don’t get a huge amount of points for a single search, but it all adds up. And let’s face it, you are essentially earning money from something you’d already be doing. In short, Google doesn’t pay you, Bing does. Tempting! When it comes to social media integration with the SERPs, Bing is the clear winner. It would have been remiss of Bing not to take advantage of the deals between parent company Microsoft and Facebook and Twitter. With more access to social data, Bing results feature trending news from social media in the news search results. Google originally only had Google+ to rely on in terms of social networks (need I say more?). However, following Google’s firehose API with Twitter that now ensures tweets are displayed in the SERPs, Google is no longer as far behind Bing on the social media integration front. There is a general consensus among search engine users that Bing simply looks better. Although the main search results look very similar, other types of searches such as news tend to fare considerably better in the Bing results. Partially due to the social integration mentioned above, Bing’s results look less cluttered and enticingly cleaner. It may be a minor difference and a relatively small point in the grander scheme of search technicalities but user experience is important and looks inevitably play a big part in this. Admittedly, it’s a tougher call than we thought between the two search engines. For us, Google is still our preferred search engine, but Bing certainly has its merits, and ultimately it’s about personal preferences. If you’re big on image and video search then you may want to consider a switch to Bing (also if you like free stuff). As for the quality of the search results, there is no longer much discrepancy between the two. If you’ve got yourself way too invested in the Google vs Bing conundrum and you need a further helping hand in pushing you to a decision, then there’s a tool for helping you compare. Aptly called ‘Bing It On’, it will directly compare the results for any given search query from both search engines side by side. Now you can compare and contrast until your heart’s content.